Beginning our southwest marathon road trip in Zion National Park, we chose to enjoy the day driving leisurely through the park enjoying the massive rock formations and stunning vistas. After hours of mind blowing visual overload we were primed for another geologic wonder, stopping in the Coral Pink Sand Dunes. I had been there once before many years prior and the very same vastness and splendor of pale pink beauty re-captivated me where this serene geologic spectacle still provides a home to some of the world’s most unique desert species who only find their home in the Coral Pink Sand Dunes and nowhere else. We stopped in Kanab, Utah for a late picnic lunch and crossed the Arizona State Line. Passing Lone Rock and Lake Powell, gorgeous rock formations, and Navajo Reservations, we took time to stop for numerous photo ops and to just take in the desert beauty and stillness. We took a driving break in Cameron, Arizona for gas and snacks and then entered the Grand Canyon, meandering slowly to enjoy the views and lookouts. From the Grand Canyon we headed on towards Sedona where we saw numerous wild javelina roaming the desert with their babies. Excitement mounted as we neared the Enchantment Resort and Mii Amo Spa—-number one spa in the US and beautiful beyond words. No wonder newlyweds love it. After a long day in the car, we were both revived and refreshed swimming late at night in the beautiful pool framed by massive red rock formations and cliffs, all under a spectacular full desert moon. We were so excited to stay at such a gorgeous place and savored every second. The next day we hiked to the ruins and cliffs and rock formations, rewarding ourselves afterwards with spa treatments at the incomparable spa. After lunch we took a Jeep off-road desert tour led by an amazing Sioux Indian, Jimmy who is a descendant of Crazy Horse. We learned so much and he made us laugh so hard our cheeks ached five minutes into the tour. It was the best off-road tour we had ever taken and we’ve taken lots. It was like doing the Rubicon Trail, but in the desert. Jimmy showed us all sorts of interesting things to see and taste in the desert. Our fabulous guide told us we just had to try the historic and famous Cowboy Club in town where he had, more than once, ridden his horse right up to the bar. We opted to follow Jimmy’s wise suggestions later in Sedona but first we stopped for lunch at Los Abrigados Resort and Spa, a lovely creek side Sedona resort where we had delicious prime rib quesadillas. Eventually that evening we did stroll town for some wine tasting and then we went to the Cowboy Club and had buffalo, snake, and cactus—dipped in prickly pear cactus sauce—all delicious! The perfect ending to a perfect day included watching a most amazing desert sunset from way up high above the entire town of Sedona where several hundred locals and tourists congregate each night to enjoy the majestic setting of the sun. Later we swam at night again, sad to know it was our last night at the Enchantment Resort—the most upscale and gorgeous resort in Sedona. The next day we drove through Phoenix and through Tempe and we arrived in Tucson in the late afternoon at the Hilton El Conquistador Tennis and Golf Resort where we enjoyed yet another splendid pool and even managed a game of tennis. An amazing dinner at Jax Kitchen was in order for our well earned appetites—fabulous scallops, gourmet shrimp tacos, flatiron steak, homemade from scratch pasta, etc. Then we swam some more at the resort before calling it a night. We couldn’t resist, as the pool and the views were so unforgettable. The next morning we left the Hilton and drove through the Saguaro National Park and to the Arizona-Sonora Desert Museum which was unique and fabulous with its two miles of outdoor desert paths of exhibits of reptiles, hummingbirds, aviaries, roadrunners, prairie dogs, etc. We decided to check out the Old Tucson Studios where hundreds of movies and westerns have been made. We took a stage coach ride and the entertaining driver was a famous stunt man who has trained horses and movie stars for decades. We saw tons of outfits and props from Little House on the Prairie, Gunsmoke, and Three Amigos. What fun. Continuing on, we drove through Las Cruces, New Mexico and crossed into Texas over the Rio Grande and Contintental Divide. Catching glimpses of Mexico many times we finally went through Border Patrol near El Paso. We got some great direction hints from the nicest Texas state trooper and chose a different route to our next stop of Marathon, Texas. It was a rather long drive and getting late but well worth it when we finally checked into our gorgeous historic hotel and resort The Gage Hotel in Marathon near Big Bend National Park. 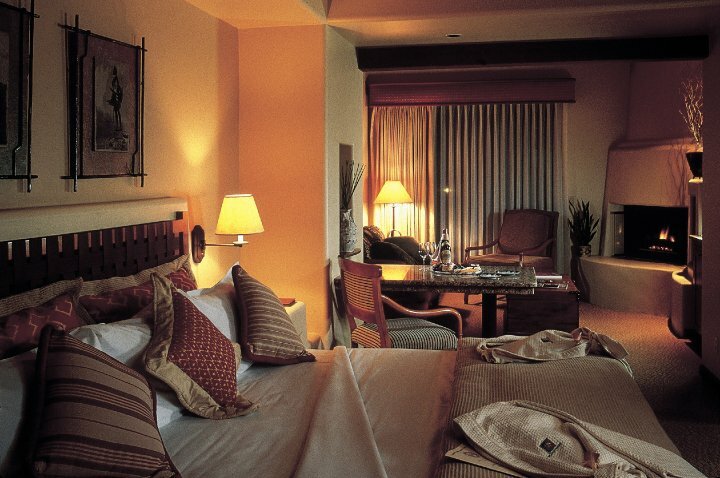 A favorite for honeymooners, you’ll see why upon arrival. Awakened the next morning by serenading birds, we took a wonderful morning swim at the Gage Hotel pool—so exquisite with the Santa Fe style architecture and gorgeous cowboy theme decor, wrought iron and Spanish style courtyards, and mission style buildings. We toured the magnificent gardens after a sumptuous breakfast and then we departed this unique and thoroughly romantic and secluded desert oasis.